"This versatile indoor/outdoor pen has excellent customer ratings." "Basic, no-frills pen to keep your dog relegated to one spot in the yard or house." "Keep your pet safe and happy on the road." "Real-life customers love this pen for its durability, sturdiness, and size." "Ultra-portable...provides pets with a massive play (or lounge) space." "Can be converted to a freestanding gate, a room divider, or a pen." Richell’s Convertible Pet Playpen takes our number one spot for its versatility, durability, simple, wood-like design and excellent customer rating. This pen is actually three pet products in one. You can use it as a hexagonal or square pen, freestanding gate or room divider—simply fold the panels to create the shape and function you want. Available in four- and six-panel options, you can customize this pen to your home and your pet’s needs. Pro tip: Some reviewers recommend buying two and linking them together to create an extra-large pen. The manufacturer recommends this pen for dogs 88 pounds and under, so if you have a larger pooch you may want to consider picking up two units. Although this pick looks like a wooden pen, it’s actually made from durable, water-resistant plastic, so it can be used both indoors and outdoors. And if it gets dirty, simply hose it down for a quick clean-up. If you’re looking for a basic, no-frills pen to keep your dog relegated to one spot in the yard or house, this eight-panel pen from Pet Trex should do the trick—and you don’t have to spend a ton of cash. Although the design is simple, this pen can be set up in multiple ways—as an octagon, square or rectangle – and comes with ground anchors and corner stabilizers for extra support and durability. Composed with heavy gauge wire finished with an electro-coat finish, this pen won’t rust when exposed to the elements—or bend if your dog attempts to scale the sides. Each of the eight panels measures 24” x 24”, so if you have a larger dog, you may want to consider buying two units and linking them together. Our favorite feature? You can build this pen (or link multiple pens together) without a single tool! If you often travel or camp with your dog, you may want to consider investing in a foldable traveling pen. Not only will it keep your dog safe and secure in unfamiliar places, but it’ll give her/him a cozy, comfortable spot to sleep, too. With over many reviews, it’s obvious that customers love EliteField’s Two-Door Soft Playpen; it makes it easy to keep your pet safe and happy on the road (or on the trails). Available in six sizes and seven color options, you can choose the perfect option to fit your dog’s needs. This pen’s floor mat and top cover are removable and washable for easy clean-up—especially if your dog happens to get carsick! Even if you don’t travel with your pets, this pen can be used indoors at home, too. Because it’s foldable, it won’t take up a ton of storage space—just pop it open when your dog is ready for a snooze. EliteField offers a two-year warranty for all of its soft pens, so if you run into any issues with the product, contact the manufacturer for a 100 percent refund. Have a larger dog? Or a puppy who just discovered his love for climbing? Ditch your flimsy pen for this heavy-duty option from BestPet. It’s available in 24”, 32” and 40” options—and multiple units can be connected—to create the perfect play space for your pooch. Real-life customers love this pen for its versatility—you can change up the configuration to create several shapes—durability, sturdiness, and size. One downside, according to reviewers, is that this pen can only be used indoors. It has to be staked into the ground to be totally supported and sturdy. Another heads up: This isn’t the easiest pen to grab-and-go. If you want to collapse this pen for travel or storage, you’ll have to remove all of the pins that connect the panels and stack the panels—it isn’t foldable, unfortunately. The RIS USA, Inc.’s Exercise Panel Pen is ultra-portable, can be used inside the house or in the yard and, when assembled, provides pets with a massive 21-square-foot play (or lounge) space. Made from super durable, heavy-duty molded plastic, this pen will never rust or degrade in various weather conditions. Plus, it’s available in 10 different color options, so you can choose the best to go with your home’s color palette. 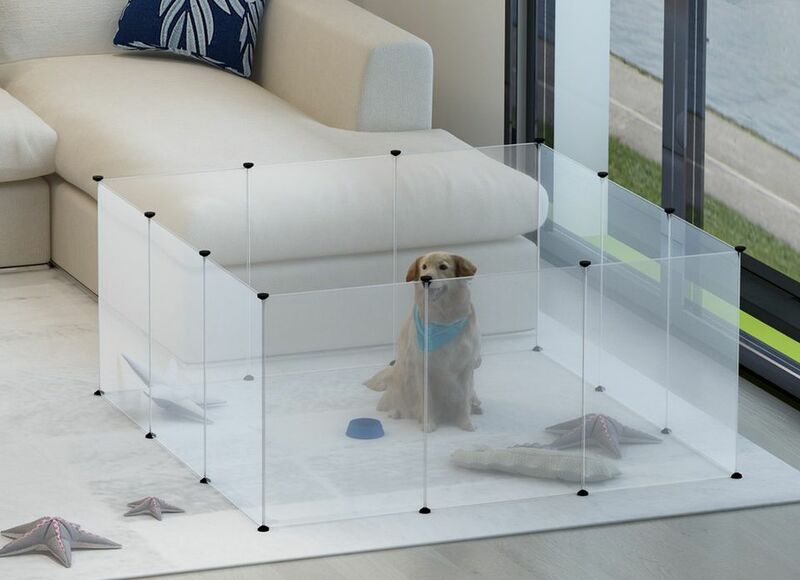 Each panel interlocks with full-length connecting rods and can be configured into different shapes and sizes to best accommodate your pet’s needs. If you need a little extra space for a larger dog—or a smaller dog who just needs a lot of space—you can connect multiple units. We never thought we’d say this, but Richell’s three-in-one Convertible Elite Pet Gate actually makes pens look sleek, stylish and ultra-functional. Plus, it’s incredibly versatile: It can be converted to a freestanding gate, a room divider or a pen. Its lockable gate door makes it easy to pass through rooms when configured as a gate or to let your pup in and out when its configured as a pen. When set-up as a pen, this pick is on the smaller side; large dog owners may want to pick up a few units to create a bigger, more spacious pen. Our favorite part? This pen actually looks good! It’s sleek and airy, so it’ll blend in with your home décor—rather than sticking out like bulky plastic pens. When it comes to an active puppy, a sturdy, appropriately-sized exercise pen is a crucial investment. While a pen isn’t a replacement for playtime outdoors, the Oxgord Heavy Duty Portable Metal Exercise Dog Playpen is definitely better than a crate if you need to leave your pooch inside for a few hours. This fully adjustable pen boasts an eight-shape panel design and multiple height options (24”, 32”, and 40”), which means you can easily customize it to your (and your pup’s!) liking. It’s made of rust-resistant metal for extreme durability, so you won't have to worry about your rambunctious pup knocking it over. Another great feature? This playpen is lightweight and foldable so you can set it up and break it down in a matter of seconds. The Oxgord Heavy Duty Portable Metal Exercise Dog Playpen covers approximately 30 square feet and its dimensions are 13" x 17" x 7".